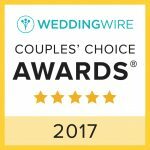 Once again in 2017, we have been named a Couples Choice Award winner on Wedding Wire. This is the eighth time in the last nine years we have been selected for this award which places us among the top five percent of wedding professionals nationwide. Many thanks to our couple’s and their families who have made this award so special to us for so many years. We vow to continue the same level of service, professionalism and creativity which has been important to so many of you on and after your special day!